We specialise in corrective exercise and holistic lifestyle coaching to ensure our clients are, moving well, look great and feeling fantastic! Welcome to Movement Lifestyle. We combine a variety of disciplines such as gymnastics, strength training, core conditioning, postural and rehabilitation exercises with a holistic lifestyle in our flagship coaching programme to make sure our clients are completely rejuvenated, looking their absolute best with fewer aches and pains. Typically our clients are lacking energy, unfit and suffering with long term aches and pains when we first meet them. Following our six month flagship programme our aim is to make sure they feel completely reborn! Adam’s background is elite level swimming, with his best event being 100 meters butterfly. After suffering with a debilitating stomach complaint that all but stopped him training he sought a multidisciplinary approach to get to the root of what the problem was. He did his training with the Chek Institute – World leaders in corrective exercise and holistic health and has worked privately with over 250 clients in the last 13 years. He also now serves as a mentor to the academy students currently under going training with the Chek Institute. 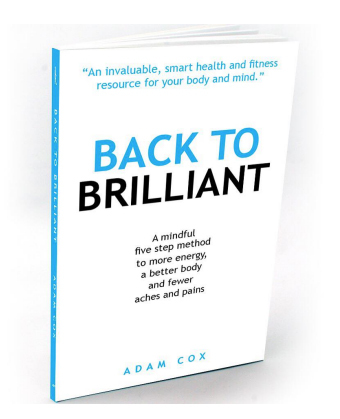 In 2016 Adam published his first book “Back to Brilliant” which became an Amazon Top 5 Ranked Book. Jameel Shah – Sports Therapist and Corrective Exercise Coach. In 2016 Jameel graduated the University of East London with a 1st class honours degree in sports therapy. Jimmy also has experience working with Championship Football side Derby County in the their rehabilitation department and currently works with West Ham Utd academy players during their rehabilitation sessions. Jimmy was selected by the Society of Sports Therapists to be the only person in the UK to achieve a travelling scholarship in 2016. During the scholarship he got to go and work with University of Windsor and Toronto, Canada, on the Athletic Therapy Programme. Jonathan has been an invaluable resource for Movement Lifestyle and as such has enabled us to improve our client results. Our services compliment one another perfectly. Jonathan also has twenty years of clinical experience and divides his time between two busy clinics in Sevenoaks, Kent and Marylebone, London. Graeme is a health physiologist with 10 years of experience within the medical and health and fitness industries. He currently consults from two private health clinics in London and one in Stockholm. The Holistic Movement Mastery Intro is designed to leave you with the exact tools we use with clients to perform bespoke and comprehensive flexibility, joint mobilisation and self massage routines. This workshop will leave you knowing exactly what needs to be stretched and what needs to be strengthened so you leave moving optimally and feel at your best! 80% of the world population will experience lower back pain at least once in their lives. 45% will experience shoulder pain. One of the areas we have noticed frequently when assessing clients, that’s at the root of many of these issues is poor posture, muscle imbalances and adhesions that mean muscles don’t function optimally. What’s more many people aren’t able to perform exercises optimally because they lack the required spinal mobility or stability and have poor posture control. It’s impossible to get a fantastic physique if you’re not able to train due to an injury! Once our clients have been taught how to use the foam roller, massage ball and mobility routine to scan and assess themselves they become much more aware of what their body needs daily, to bring it into balance. Health is nothing more than taking responsibility for yourself and these tools allow you to do just that, take responsibility for your musculo-skeltal health and wellbeing. How to stretch yourself thoroughly, quickly and in a manner that balances YOUR body. How to switch on important stabilising muscles of the shoulder, spine and hips in our warm up/prehab routine. We’ll use the foam roller to open the chest and establish a natural breathing rhythm, mobilise the spine and massage tension from the thighs and lower body. Starting from the foot and working all the way up to the head, we’ll look for areas of tension that are either causing pain by way of referral or impeding optimal mechanics of the body. Following this flowing routine daily will allow you to become much more aware of what state your body is in and how intense your exercise for that day should be. You will be given a tick sheet to keep track of which areas need more attention than others so you can produce your own, bespoke flexibility plan, therefore balancing your muscles perfectly. We’ll teach you the exact warm up routine we use with clients in our Holistic Movement Mastery Programme to activate important stabilising muscles of the shoulder, spine and hips for injury prevention. In the final section you’ll get an insight into some of the core and spinal stability movements that are involved in our flagship programme so you can begin building better core control and use them to injure proof or rehabilitate a long term instability. Download part one of our book Back to Brilliant for FREE. Learn from those before you and avoid the same mistakes. Adam shares more about our methodologies and answers client questions with actionable, informative videos on YouTube. The Holistic Movement Mastery Questionnaire will help you discover roadblocks on your journey Back to Brilliant and contains tips on how to overcome them. We are only able to onboard two clients per month onto our, Holistic Movement Mastery Programme. This is due to the bespoke nature of the work we do with clients to make sure they receive the very best coaching and support on their journey. Our aim is to leave every client moving significantly better resulting in fewer aches and pains, with a level of fitness that balances their body for optimal health and feeling significantly more energetic with a bounce in their step.